Environmental exposure to other patients carrying an agent is an important risk for many serious infections. This so‐called “colonization pressure” has been implicated in the acquisition of Clostridium difficile‐associated disease (CDAD) in the ICU setting and in the hospital as a whole. The purpose of this study was to enumerate the various risks for CDAD and to confirm colonization pressure as an independent factor in a large sample of inpatients with CDAD. The study took place in a large tertiary‐care hospital with a corporate data store containing detailed patient information. A search of computerized records from January 1, 2000, through July 31, 2008, revealed 1497 patients who acquired CDAD while hospitalized. Each patient was matched with 4 control patients discharged the same year. 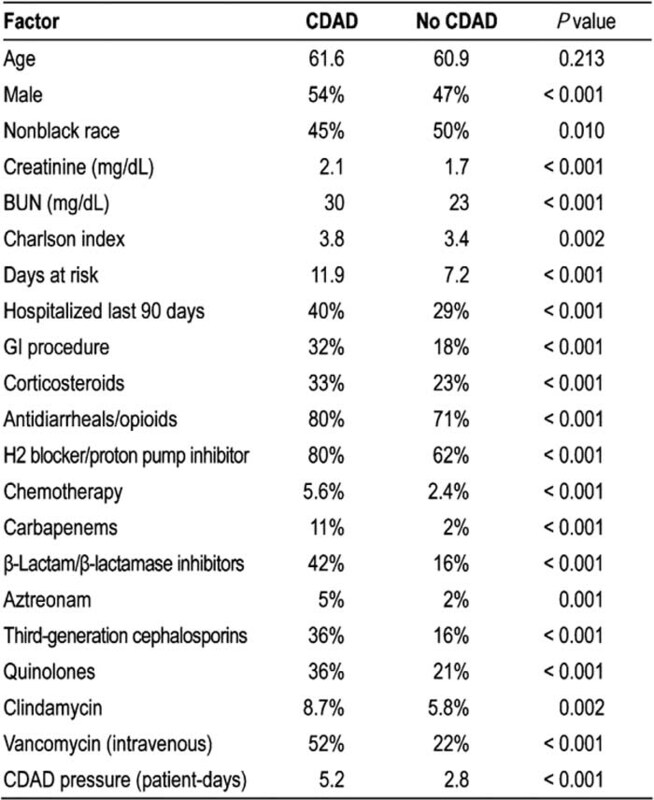 Based on previously published studies, the following variables were explored: demographics, days in the hospital, Charlson index, prior hospitalizations, gastrointestinal procedures, medications, and admission creatinine/blood urea nitrogen. In addition, CDAD pressure, a modified form of colonization pressure based on the number of CDAD cases present on the same ward, was tested as a risk factor for CDAD. Conditional logistic regression was used for bivariate and multivariate analyses. A total of 7485 patients were included in the analysis, of whom 1497 had CDAD. The results of bivariate analysis are shown in Table 1. CDAD pressure was significantly higher in the patients who acquired Clostridium difficile‐associated disease. Table 2 lists the significant variables found by logistic regression. Multivariate analysis confirmed CDAD pressure as an independent risk factor for CDAD after adjustment for demographics, severity of illness, medications received, serum BUN, and abdominal procedures performed. This study confirms recent reports suggesting that CDAD pressure is an independent risk for acquiring CDAD in the hospital. The association of disease pressure with CDAD acquisition highlights the importance of sterilizing the environment in protecting patients from Clostridium difficile disease. A measure of CDAD pressure should be included in future studies that aim to evaluate the risks of CDAD. 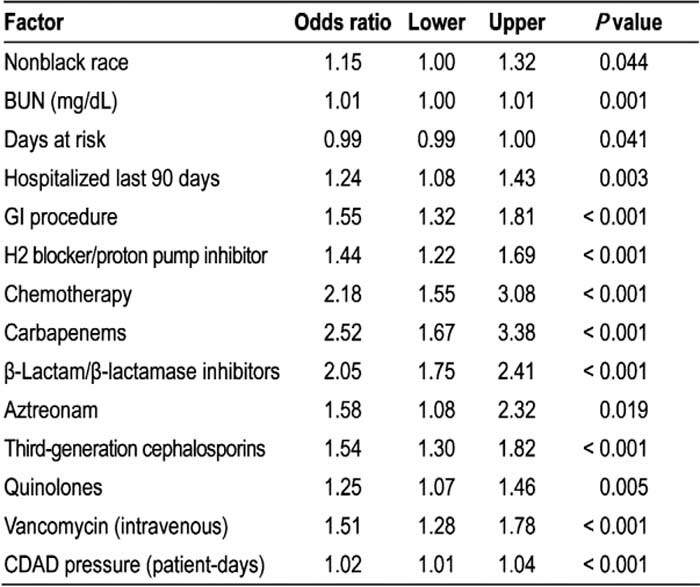 Buran G. Risk Factors for Clostridium difficile‐Associated Disease in the Hospital. Abstract published at Hospital Medicine 2009, May 14-17, Chicago, Ill. Abstract 18. Journal of Hospital Medicine. 2009; 4 (suppl 1). https://www.shmabstracts.com/abstract/risk-factors-for-clostridium-difficileassociated-disease-in-the-hospital/. Accessed April 25, 2019.